PT Kereta Commuter Indonesia - PT KCI is a reputable company in Indonesia, based in Jakarta and negaged in mass transportation services. Previously known as PT KAI Commuter Jabodetabek (PT KCJ), PT KCI is a directly-owned subsidiary company of state-owned railways giant PT Kereta Api Indonesia (Persero). At present, PT KCI is 99.79% owned by PT Kereta Api Indonesia (Persero) or known as KAI Group. Other 0.22% remaining shares was owned by Pusaka Foundation. 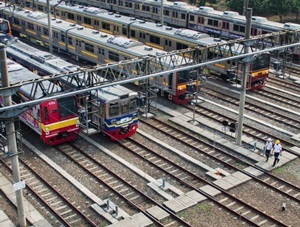 PT KCI operates primarily as a Commuter line or KRL (Indonesian: Kereta Rel Listrik) Operator for Electric multiple unit (EMU). PT KCI provides commuter railways transportation services in the Greater Jakarta and its surrounding; Jakarta, Bogor, Depok, Tangerang and Bekasi, Banten and Cikarang. PT KCI now has 826 units of Light Rail (KRL) which serving 72 stations throughout JABODETABEK with a range of service reaches 184.5 km. According to information found in PT Kereta Api Indonesia (Persero) Annual Report 2016 as cited by JobsCDC.com, PT KCI managed to recorded a positive financial performance in the business year of 2016. PT KCI booked total revenue of Rp2,044.95 billion in 2016. This number is up 18.2% year-on-year (YOY) from Rp 1,729.75 billion in 2015. Referring to its annual report, PT KCI reported total net profit of Rp288.39 billion in 2016, increasing 13.5% from net profit in 2015 of Rp254.12 billion. Male/Female, minimum age of 21 years and maximum age of 30 years old. Minimum S1 degree in Informatics Engineering, Information System from a reputable university accredited A with a minimum GPA of 2.95. Strong understanding about the concept of OOP,Application Development Life Cycle, Operating System, Networking and Payment Industry Standards (chip base/server base). Male/Female, minimum age of 20 years and maximum age of 27 years old. Minimum D3 degree in Electronics Engineering, Civil Engineering from a reputable university accredited A or B for State Universities with a minimum GPA of 2.95. Minimum D3 degree in Nursing from a reputable university accredited A or B for State Universities with a minimum GPA of 2.95. Have a Certificate of Health Worker Registration (STRTK). Minimum height of 160 cm for Male and 155 cm for Female with a balanced / ideal weight. Never been dismissed not honorably as a State Civil Apparatus, TNI / POLRI or other institutions. Not have a marital relationship with the employees of PT KCI. JobsCDC.com now available on android device. Download now on Google Play here. Please be aware of recruitment fraud. The entire stage of this selection process is free of charge. PT Kereta Commuter Indonesia - Services Staff, Medical Officer, IT Commercial KAI Group October 2018 will never ask for fees or upfront payments for any purposes during the recruitment process such as transportation and accommodation.